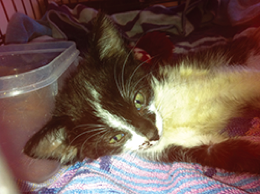 A kitten was found inside the Materials Recovery Facility at the RRRC on Wednesday the 3rd of April. Sadly, it seems as though she made her way into a yellow-topped bin. A truck driver who was dumping a load of recycling on the tip floor noticed the tiny black and white kitten and notified the MRF Team Leader. Tour Coordinator Emily Tomsett then immediately stopped all traffic and went into the plant to try to find the kitten and was surprised at how quickly they came across it. 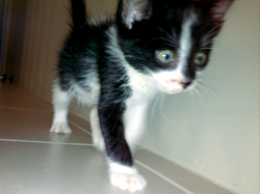 â€œAs we walked into the plant I thought to myself how on earth will we find a kitten amongst 200 tonnes of recycling. As we approached the spot where it was sighted, there it was clambering over a pile of brightly coloured industrial plastics." Emily said. The clearly distressed and dirty kitten was then quickly scooped up by Emily and taken to safety. The kitten has now been rehoused and named â€˜Angelâ€™. Angel was taken to the vet where it was estimated she is about 4 weeks old. It took her two days to recover from her ordeal. Angel will not be short of love and affection in her new home with 6 children and another 5 month old kitten to play with! 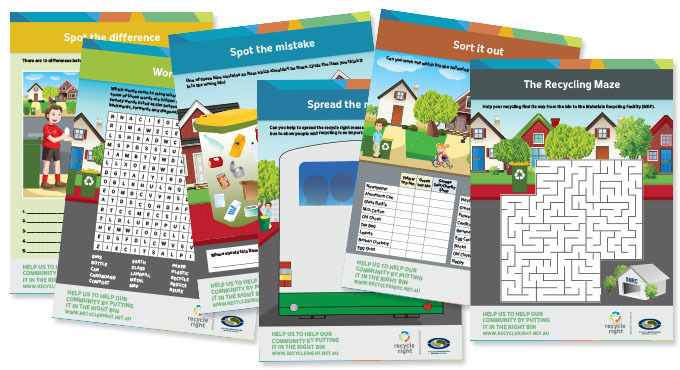 Download our worksheets and have some fun learning about recycling and sustainability. 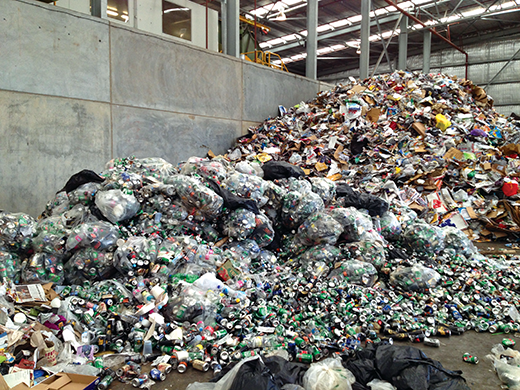 You could also incorporate the worksheets with a free tour of the Regional Resource Recovery Centre in Canning Vale. See the tours section at the bottom of this newsletter for more details. Incidences of odour are also immediately sent to the DEC so their officers can attend to determine the source of the odour. The SMRC voluntarily suspended receiving waste at its Waste Composting Facility on 13th December 2012 to allow the completion of upgrades to the odour management system. Upgrades have now been successfully completed and the odour management system has been in a testing and evaluation phase since early March. The SMRC has been working closely with the DEC during this testing phase ensuring the odour management system is operating according to the design parameters required by the Licence. During this time the volume of waste received has been incrementally phased up to the licensed capacity of 1,365 tonnes per week. This means that waste from the SMRCâ€™s member councils will no longer be sent to landfill. If you experience an odour or would like to provide feedback to the SMRC please call the Community Feedback Hotline on 1300 556 726. You could win up to one cubic metre of compost thanks to Nutrarich! This is a week of activities, events and publicity to improve awareness about the importance of this valuable organic resource and to promote compost use, knowledge and products. The SMRC are running two community tours in this week as well as tours for schools, garden clubs or anyone interested in coming to see how we make compost from the contents of your green-topped bin at the RRRC. Thanks to Nutrarich the SMRC will be giving one lucky tour participant up to one cubic metre of compost! Perth is one of the most biodiverse cities in the world with the Swan Coastal Plain housing many endemic species of plants and animals. This means they are found nowhere else in the world. Within the Regional Resource Recovery Centre is an area of native remnant banksia woodland which houses some of these remarkable plants and animals. As part of the Environmental Improvement Projects conducted at the Regional Resource Recovery Centre, the Landscape Improvement Plan identifies the management of native bush land for treatment of Phytophthora (Dieback) which is present in Ken Hurst Park, surrounding one side of the RRRC. The SMRC maintains this vegetation by compiling with the Office of Environmental Protection Authority objective for the RRRC to maintain the abundance, species diversity, geographic distribution and productivity of vegetation communities on site. Two of the three areas sampled were positive for the introduced water mould Phytophthora (Dieback). After the vegetation area was mapped out for treatment, stem injection and spray treatment with phosphite was conducted in the affected areas. The next treatment is due in December 2015. The SMRC accepted some recyclables from the Blues n Roots Festival in March. It is great to see people recycling responsibly at public events. The waste looked quite different from normal household commingled recycling we receive at the SMRC. 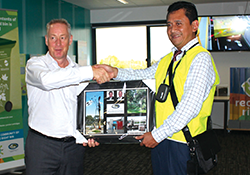 On Thursday the 4th of April the CEO and staff along with the WA Local Government Association hosted an event at the RRRC to welcome an Indonesian Local Government delegation from West Java, led by Mayor Diani Budiarto, Mayor of Bogor Regency. The group were in Western Australia to visit Alternative Waste Treatment Facilities. The group thoroughly enjoyed themselves learning about recovery rates and education as well as seeing the plant in operation. 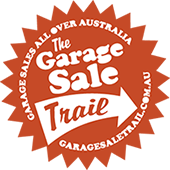 Garage Sale Trail is glad to advise that there are 22 councils participating in the program in WA this year, representing over one million Western Australians. It's a great start for the program in WA. Under the amended licence the SMRC are required to publish the results of the independent Field Ambient Odour Assessments on our website. These results will be available by 5pm on the first Wednesday of each month and will show results for the previous month. In this section of our website there is also an explanation on the methodology used to conduct the surveys and the full 38 page methodology can also be downloaded. The amended licence also requires that a summary of complaints be published in the format of a weekly summary of information contained in the complaints register. This will also be available on the SMRC website by 5pm on the first Wednesday of each month. Performance Testing has been carried out on the Humidifiers to ensure they met the criteria set by the DEC.
Approval has been received from the DEC to commence acceptance of waste rising to 1365 tonnes per week. Tour Coordinator, Emily Tomsett, can provide your school or community group with a fantastic and informative tour of the Regional Resource Recovery Centreâ€™s Waste Composting Facility! 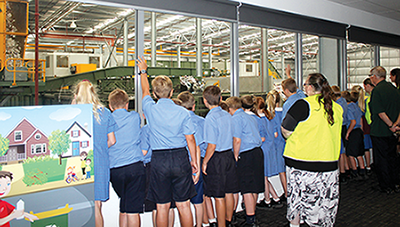 To see first-hand what happens to waste at the RRRC give Emily a call and book a tour on 9256 9555 or email tours@smrc.com.au. We are now taking bookings for tours of the Materials Recovery Facility. 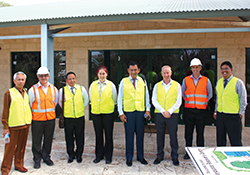 For your chance to see the new facility, please contact Emily Tomsett on 9256 9555. 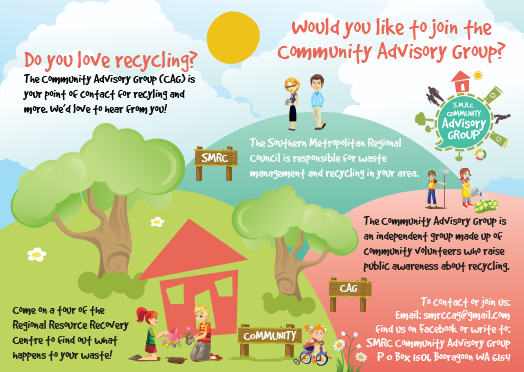 The Community Advisory Group is an independent group of devoted community volunteers who work actively to increase the community understanding of recycling. They meet between February and November each year. To contact, join or find out more please email smrccag@gmail.com or write to them at SMRC Community Advisory Group, PO Box 1501, Booragoon WA 6154. Copyright Â© 2013 Southern Metropolitan Regional Council, All rights reserved.